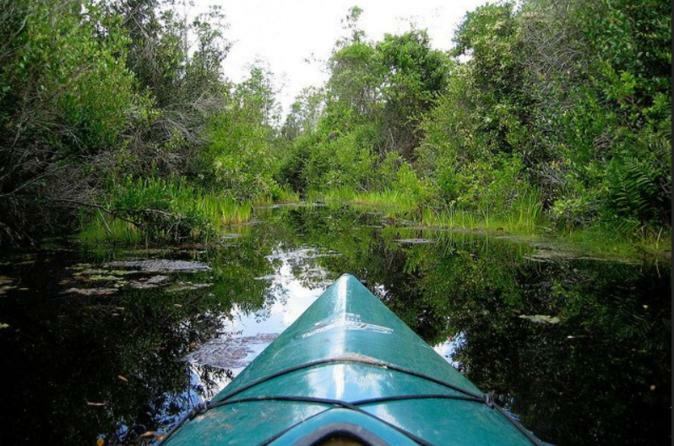 Choose to rent a kayak or canoe for a self-guided tour of the scenic bayou through one of the most biologically productive estuaries in the world. Enjoy getting as close to nature as possible as you view the local alligators sunning themselves, the fish jumping, the birds singing and eating, and the flowers blooming in and above the water. This tour is an opportunity for a peaceful morning paddle with amazing photograph opportunities as well as an educational experience for those that want to explore Louisiana's beautiful bayous. When you arrive we will have your rental boat, life preservers, paddles, and any other rental items you have arranged waiting at our boat launch. After a brief safety discussion and paddling instruction, you will make a short trip along Bayou Barataria where you can see the local fishing boats and the famous Fleming Burial Grounds along the waterway. As you enter the Jean Lafitte National HIstorical Park and Preserve Barataria Preserve Unit, the water becomes calmer and you choose your own pace as you explore. You have your choice of direction from there but we recommend traveling into Kenta Canal, where you will find coves and inlets. These wetlands and bays offer many unique natural treasures to explore. Watch for the alligators and the many other local wildlife that usually are seen along this tour. After about 2 hours, we recommend that you begin your return to our launch. The ever-changing bayou offers a new experience each time you pass an area so keep your eyes open on your return as well! Your local owner and operator, DJ, will be waiting to assist you as you return to our launch and can give lots of advise on our area and tour and travel opportunities.